Back in the day, traveling was a complicated activity. For starters, you had to visit a travel agency that would proceed to plan out your trip. Travel agencies had control of your entire vacation, from plane tickets and hotel reservations, even sometimes to daily itineraries. Now, however, things have drastically changed. The modern traveler has no need for those archaic means. Instead, they resort to travel sites and apps that are designed to make traveling easy. Through travel sites and apps, you can book a flight, accommodation, and even learn about the trendiest spot in any city around the globe. All it takes is a few clicks or taps and your ideal vacation is all set. Before you plan your next escape, here are the 13 best travel sites and apps you’ll love to use. The first thing you want to do when planning a trip is to figure out how to get there and where to stay. With Skyscanner, you can do all that and much more. 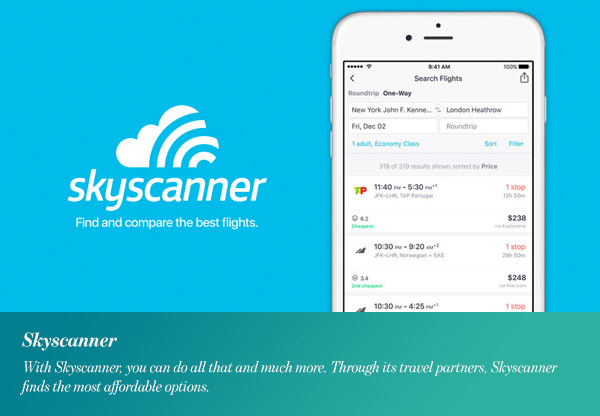 Through its travel partners, Skyscanner finds the most affordable options. Moreover, it shows you the cheapest dates to fly and even alerts you when prices change. This site also offers “Top Deals” and a list of chosen destinations at affordable prices. Through Skyscanner, you can also compare hotel and car rental prices before proceeding with a booking. 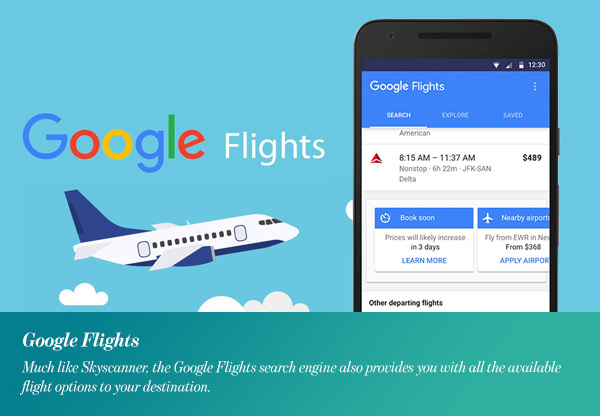 Much like Skyscanner, the Google Flights search engine also provides you with all the available flight options to your destination. You can filter based on the number of stops on your trip, the airline, and time of day. It also has a calendar showing the cheapest dates to fly during the month. Furthermore, new features have the ability to predict delays. 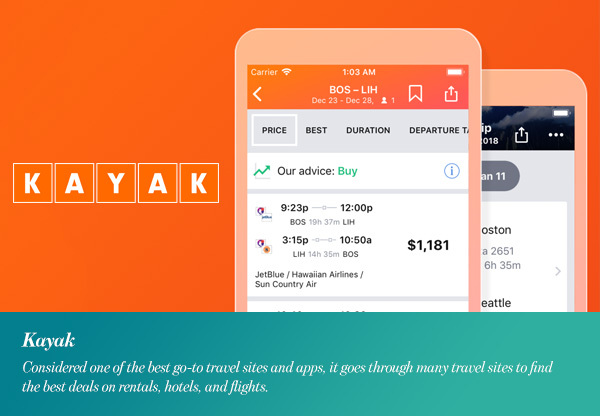 Anyone who has planned a trip has probably stumbled upon Kayak. Considered one of the best go-to travel sites and apps, it goes through many travel sites to find the best deals on rentals, hotels, and flights. Moreover, Kayak offers exclusive deals that are not available on other sites. It even has a Price Forecast feature that helps you decide whether to buy now or later. That’s not all though, as Kayak is also a trip planner. You can easily access important details like hotel confirmation number or gate number. 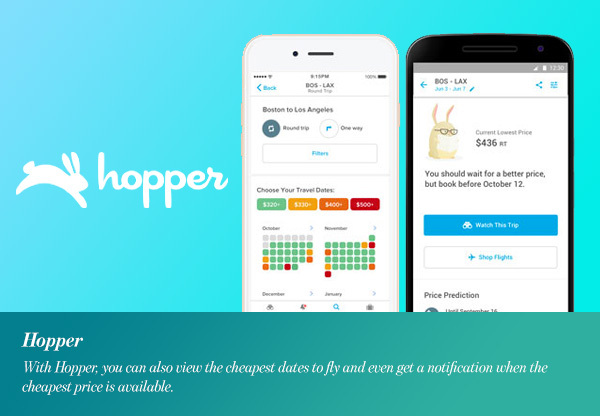 If you want to find the cheapest plane ticket, then Hopper will definitely help you out. With Hopper, you can also view the cheapest dates to fly and even get a notification when the cheapest price is available. Furthermore, Hopper claims it can save you up to 40 percent on your next flight through analyzing and tracking billions of flights. With a user-friendly interface, you can book a flight in 60 seconds or less. In 2015, Hopper was on the Apple App Store’s Best of 2015 list. It was also a 2016 Google Play Award winner. For many young travelers, hotels are a thing of the past. 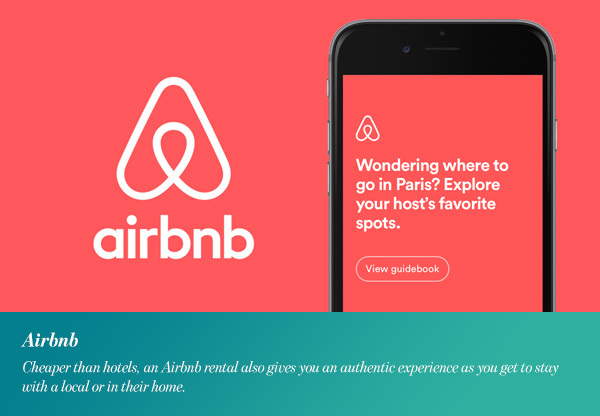 Now, many people are opting for home rentals through Airbnb. Cheaper than hotels, an Airbnb rental also gives you an authentic experience as you get to stay with a local or in their home. However, remember to be careful when renting through Airbnb. Always check the home’s reviews before proceeding with the booking. 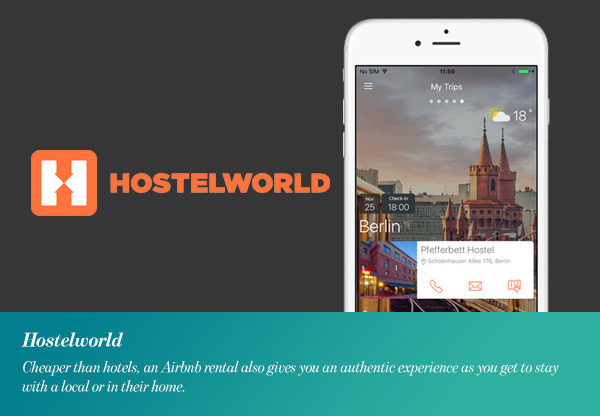 For travelers who avoid hotels, Hostelworld is a great alternative. Through this site, you can search for a bed in a hostel dorm or even your own room. The site’s filters let you choose a hostel based on location, price, facilities, and hostel type. Depending on your preference and budget, you can find a hostel anywhere in the world. If you are an adventurous traveler, then Couchsurfing is for you. This site connects travelers with locals and gives you an authentic experience like no other. With Couchsurfing, you will get to meet locals who may also offer you suggestions for a more genuine trip. Last minute problems and traveling go hand in hand. Whether there was a problem with your booking or your flight was delayed, Hotel Tonight will find you a place to stay. 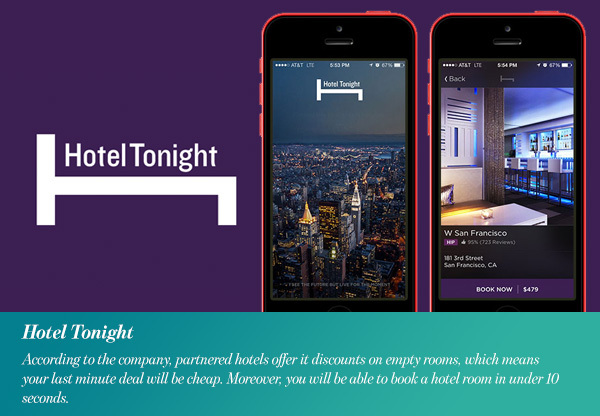 According to the company, partnered hotels offer it discounts on empty rooms, which means your last minute deal will be cheap. Moreover, you will be able to book a hotel room in under 10 seconds. Now that you’ve booked your flight and accommodation, it’s time to learn more about the destination you’re visiting. 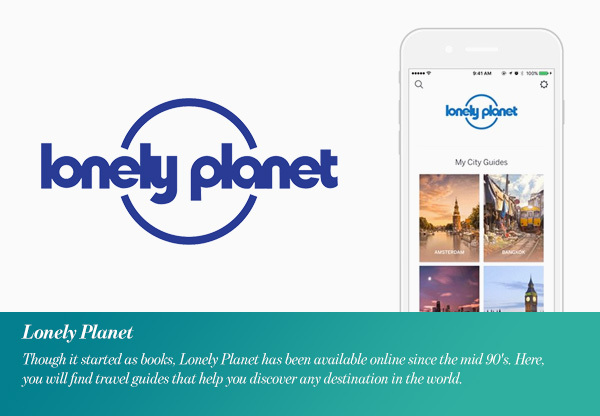 Though it started as books, Lonely Planet has been available online since the mid 90’s. Here, you will find travel guides that help you discover any destination in the world. You can use TripAdvisor when it comes to almost anything related to your trip. Look up restaurants, hotels, airlines, and even entertainment venues to read reviews. Furthermore, most reviews come with pictures to give you an idea about places you plan to visit. The best part is the reviews are written by users who have had experiences, so they are mostly genuine. You can also use the “Near Me” feature which offers well-reviewed places around your current location. 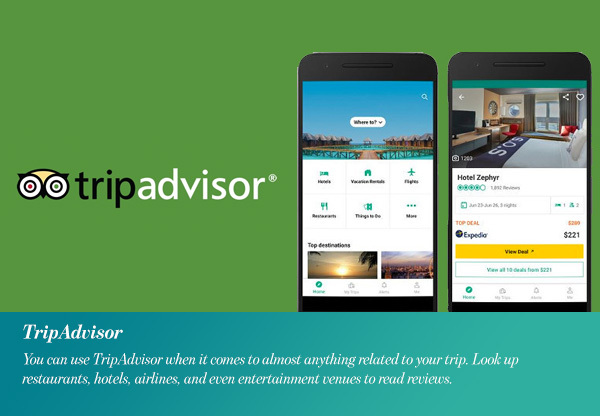 TripAdvisor can be used anywhere in the world, which means it can guide your travels wherever you are. 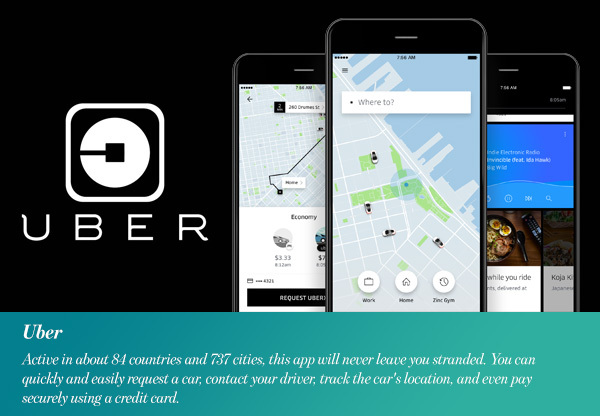 Though it is not used to arrange travel plans, Uber is definitely useful wherever you are. Active in about 84 countries and 737 cities, this app will never leave you stranded. You can quickly and easily request a car, contact your driver, track the car’s location, and even pay securely using a credit card. You won’t need to stand in a line at the airport or find the nearest metro or best route. That is why Uber is one of the best travel sites and apps to have with you during your travels. Steadily growing across the world, Citymapper is a comprehensive tool that helps you find and use public transportation. 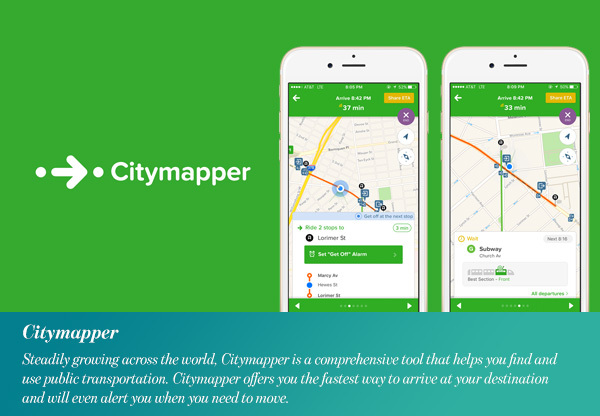 Citymapper offers you the fastest way to arrive at your destination and will even alert you when you need to move. You can even look at subway and train times offline in some cities and subscribe to specific train or bus lines. Easy, fast, and reliable, Google Maps has earned its spot as one of the best travel sites and apps. The navigation app helps you get around and provides local public transportation options in many countries. 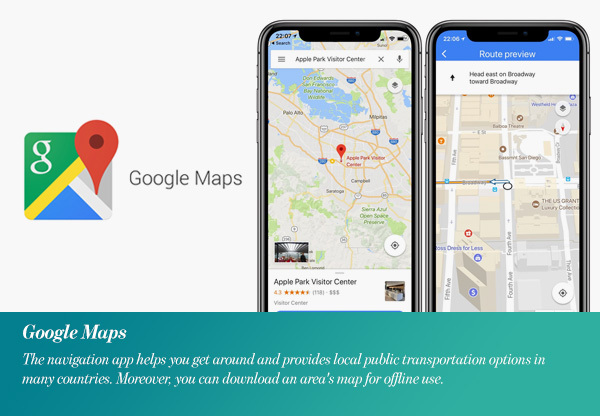 Moreover, you can download an area’s map for offline use. With Google Maps, you can even see when places are open and how busy they are at any given time.